I make a lot of preserves. I love selling at the Sackville Farmer’s Market and catching up with old friends and meeting new ones. There really is no better place to be on a Saturday morning. Each year, I make 20-30 different types of preserves and almost 400 jars of preserves. You’d think that I’d finally figure some things out, like, how to make a great jelly (strain, strain, strain!) or that if you don’t add enough underripe strawberries, you’ll never get a great set on a pectin-free strawberry jam. So, I continue to plod on, making rookie mistakes and plunking those jars of unsellable preserves in my pantry. Well, I have almost 100 jars in my pantry. Too many. Way too many! Apparently, some lessons need to be learned over and over again. Like jelly, especially pepper jelly. Maybe it’s just me, but when it’s hot and humid, I have the worst time getting a jelly to set properly. I’ve opened windows, I’ve closed windows and brought up a dehumidifier, I’ve tried canning first thing in the morning or really late at night and still, it can be endless jars of jelly that either set too quickly before I could gently tilt the jars and distribute the little bits or it’s a runny syrup. Often times, if it’s not a problem with the set, it’s a problem because I’m neither paying enough attention nor thinking through the steps and so another batch of preserves gets shipped off to the pantry. This recipe utilizes one of those jars of unsellable jelly – a beautiful apple cider jelly and jalapeno jelly that is perfect and tasty but oh so cloudy. Natural apple cider has sediment and needs to be strained, preferably in a coffee filter, to make the jelly a beautiful amber hue. 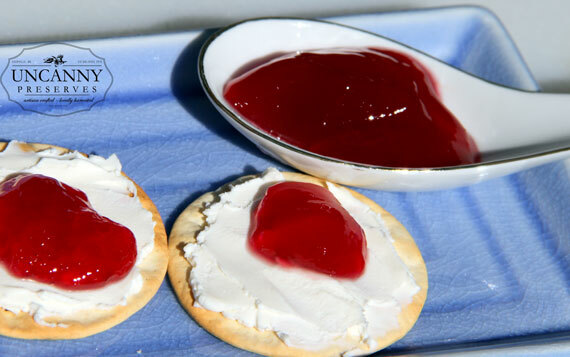 Since there is only so much pepper jelly one can eat on crackers, enter scones. 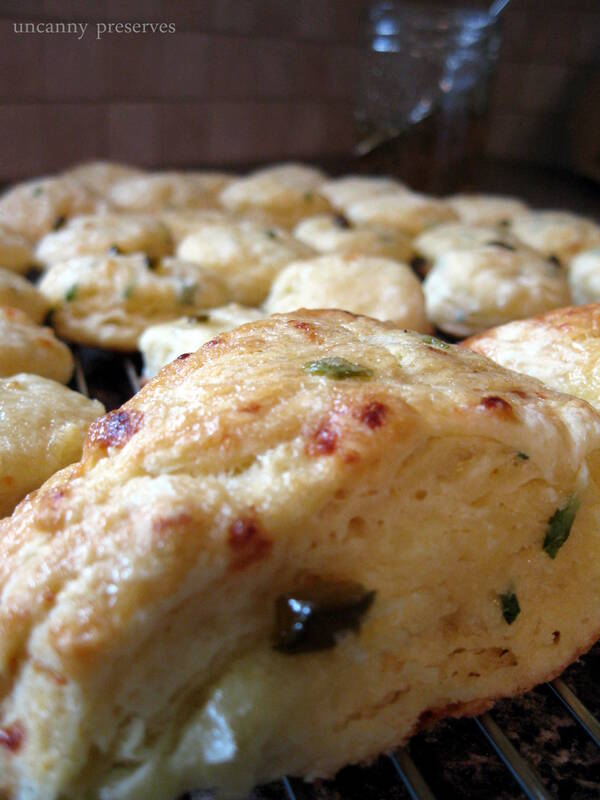 I’m a sucker for a sweet scone, but I had no idea a savoury scone could be so incredible. I made these for the end-of-the-year book club meeting with the additional jelly stirred into some cream cheese and ready to be slathered on the warm scones. They were flakey and rich and all the flavours worked well together. Even better that a lonely, neglected jar of jelly got a new life. Mix together dry ingredients and with a pastry knife, cut in the cold, cubed butter until it’s a coarse and crumbly mixture. Add in the cheese and herbs and stir. In a separate bowl, whisk egg and milk together and pour over the dry mixture. Stir until barely combined and turn onto a lightly floured board and knead 10 times (Canadian Living is very specific on this and I’ve heard from other expert scone makers that ten is the magic number here). Roll or pat to about 3/4″ thick and cut out with a cookie cutter. I often use a 2″ round cutter as it seems the best size, or cut into fours for a traditional wedge shape. Place scones on a parchment paper lined baking sheet.